My mom is one of my best friends. Some times I think about the stuff I put her though when I was growing up and I am ashamed of myself. No one else in my life will love me the way she does. No one else will ever forgive me as many times as she has. And no one will watch out for me like she does. Having a good mom is kind of like having a Guardian Angel. She will always look out for you, protect you when she can and when she is near you feel safe. I know as I a mom I would do anything for my boys. Cross any line to make sure they were okay. I am proud to say my mom is the same and no matter how bad life gets I know I always have her on my side. A few years ago I started to give my mom "snow Angels" they are these cute little Angel babies with my siblings and my own birthstones in them. She adores them, after that I got her a Guardian Angel pendant for her car to keep her safe. Again my mom loved it. It kind of became a thing then to give her Angel stuff. My brother found these really neat country decor Angels that she has all over her living room. And my sister even got her a bunch of Angel tree decoration for Christmas last year. 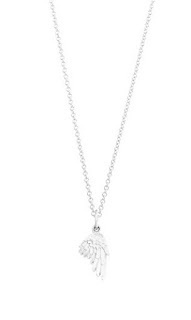 This year though I think I may top them all with my Helen Ficalora Angel Wing Charm necklace. This is something my mom can wear everyday. And even though I will never tell her, for me it is my way of giving her the Angel Wings I always thought she had. The Angel Wing Mini Charm is approximately 15.3mm X 8.5mm. This small charm pendant is available in 14k Yellow Gold, White Gold, Pink Gold or Sterling Silver. Now I plan to give it to my mom for Christmas, but I can see this being the perfect gift for any occasion! Birthdays, anniversaries and even V-Day. I know if my hubby gave me Angel Wings for V-Day and told me it was because I was his Angel, that I would most likely make him a steak dinner every night for a month!! The Angel Wing is stunning and has a lustrous/shiny glow. I would compare the size to my pointer finger nail. To give you an idea of how big it is. As you can see from the photo there is also a chain. The charm and chain are sold separately. The chain is super durable and you can order whatever size you need. Mine was 18" even though I got this for my mom I tried it on so I could give you and idea of length. The 18" sits in the hollow part of my neck. The chains come in fine, chunky or medium. They also come in sterling silver, white gold, yellow gold or pink gold. 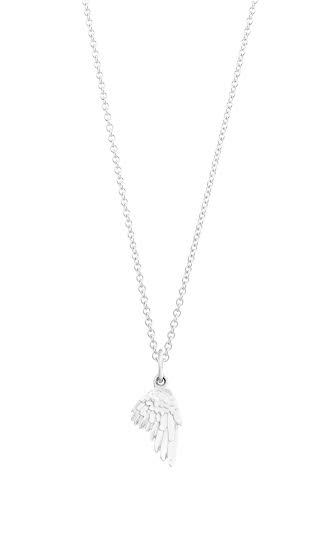 The Angel Wing charm is only one of the many charms offered at Helen Ficalora and the necklace is only one of many items offered. They also have earrings and rings.